The Gracious Hospital-i-Tea Blog-a-Thon continues at http://www.gracioushospitality.blogspot.com/ I am enjoying participating and invite you to join! The theme this week is Litera-TeaShare. The challenge is to Share tea from the perspective of literature. 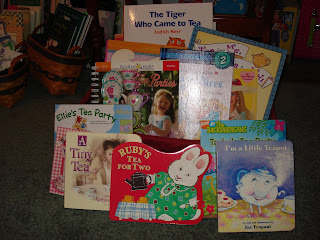 The second photo above features children's tea storybooks. The grandchildren and I enjoy reading tea stories and having tea parties. We also like to make up stories about princes and princesses having tea parties. No matter what happens in these stories, they always host or attend fabulous tea parties in beautiful castles and have happy endings! 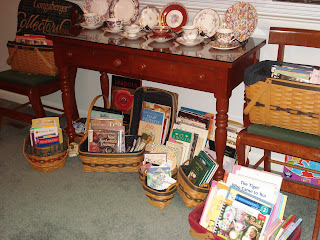 The third photo from the top is a display of books by Kentucky authors Bruce and Shelley Richardson of Elmwood Inn Fine Teas. Their three recipe books are among my most used books. The two Great Tearooms books and the Tea in the City books are well-worn and marked as I have used them several times to plan tea travels. Bruce's amazing photography and Shelley's thoughtful writings in "Look Deeply into Tea" gives the reader insight into the people who labor to bring the tea leaf to the cup. Every tea lover should have at least one of their books! The photo at the bottom shows books by Jane Pettigrew, a very experienced and knowledgeable woman in the world of tea. Her books read like fascinating textbooks on tea and are sprinkled with beautiful artwork and photography! Every tea library should have a copy of "The Tealover's Companion" co-written with Bruce Richardson. 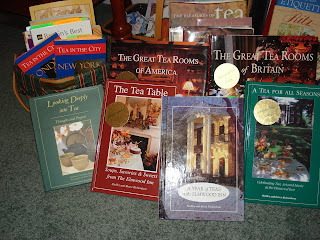 I have many"favorite" tea books and publications. I have written about a few in previous posts and will continue to highlight more in the future. Choosing a favorite tea book for me is a bit like the following poem from the children's book "Tea Party Today, Poems to Sip and Savor" by Ellen Spinelli. Which tea shall I buy today? English breakfast? Earl Grey? Ginger? Sassafrass or spiced? Rosehip, orange, lemon-iced? Apple, peppermint, or peach? Oh, just give me one of each. ok, if there is an award....you win! Oh my goodness, you certainly have the books! I am sure they have given many hours of enjoyment. It's great to have a look at your tea book collection display. I keep mine in the hutch and on the table in my kitchen. Wow, and impressive collection of tea books! You have an enviable collection of books about tea! That's wonderful! Wow - now that is a collection! But, I really like your baskets!!! OK, I know we're not supposed to covet, but ... 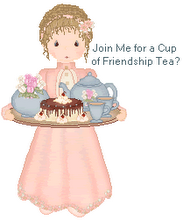 I see some tea titles I am missing -- like two new Jane Pettigrew books! I got to meet her at World Tea Expo last year and she was just lovely, very approachable and friendly. Amazon and eBay, here I come! Your collection looks a lot like mine.... only yours is better organized and displayed nicely! WOW! I've never seen so many tea books in one personal collection! How wonderful that you share your passion of tea with your grandchildren. I am sure you make many wonderful memories with them! Aha! 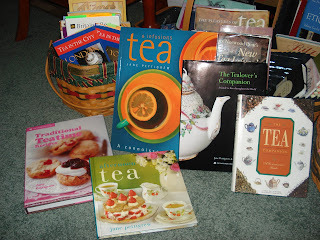 I've found someone with a tea book collection like mine. So many books out there, so little room for them all. I've got 60-70 and see more that I want. Ooooo - thank you! I will have to note down the title for those children's books for my niece! My favorite was the basket of children's books! How fun! My first thoughts when I arrived for a visit were...you win! :) What an awesome collection of tea books, a person could be lost for days reading your collection, how wonderful! Thank you for sharing! What a wonderful collection of tea books! What a beautiful and extensive tea book collection, Linda. You have some great titles. I especially love the children's books you have with a tea theme. So very special to share with grandchildren! They are very lucky to have a 'tea grandma'!